Let's go on a sensory exploration of the Arctic! Your adventure will include sightings of the mighty polar bear, elusive arctic wolf, as well as arctic hare, walrus, seal, orca whale, and an adult & baby penguin. You will see the "permafrost" under the soft snow, spy animals eating "lichen", check out the arctic "ocean" - and lots of cool sensory "snow" and "ice". Enjoy an exciting trip to the arctic tundra. Let's go on a sensory adventure to the Forest. Your adventure will include sightings of a raccoon, bear, badger, beaver, lynx, squirrel, skunk, and more. You will see pine trees, pinecones, acorns, berries, leaves, a stream, and smell some fresh cut wood. You may even spy a small snake, turtle, or mouse on the ground. Enjoy your hike through the forest. This adds to what kids explored in the Phase 1 Forest Explore C.E.L.S. & takes it up to a higher level. 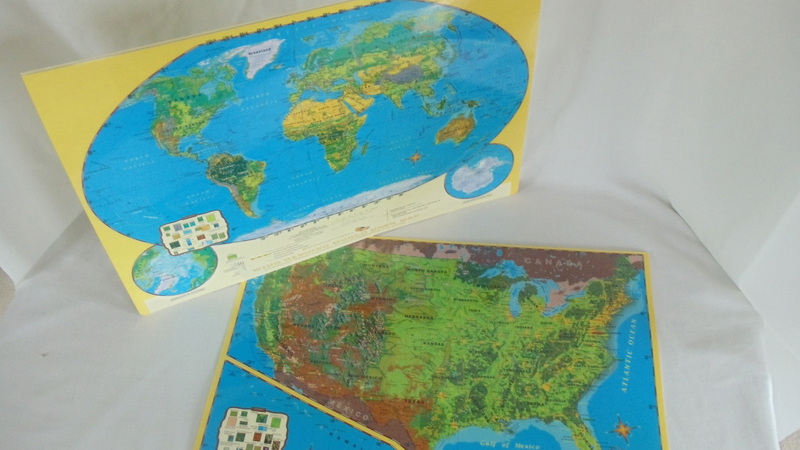 Your child will be using a world map to learn map reading skills and more about the animals of the forest biome. They will also be adding new vocabulary and includes a set of cards with more info & exciting facts about the forest biome, a game to test your child's skill identifying animals of the forest, a game about the threatened & endangered animals of the biome and a fun game using the map & magnetic animals to learn where they live and how they survive there. Let's go on a sensory adventure to the Grasslands. Your adventure will include sightings of animals like warthogs, lions, elephants, giraffes and more. These are the same kinds of animals you often see at the zoo too. There are grasses, cliffs and trees along with other sensory tools to help you have a great sensory experience. Oh, the wonders of the ocean! Your underwater sensory adventure will include sightings of 8 large animals, including a crab, whale, lobster, octopus, squid, dolphin, manta ray, & a shark. You will have fun exploring the the blue ocean water, as well as seaweed, a ship, seashells, sea urchins, and a sponge. Keep your eyes open for a sea turtle, small sea animals, and other underwater treasures. You will love your amazing dive into the Ocean. Phase 2 adds to what kids explored in the Phase 1 Ocean Explore C.E.L.S. and takes it up to a higher level. Your child will be using a world map to learn map reading skills and more about the animals of the ocean biome. They will also be adding new vocabulary and geography. Includes a set of cards with more info. & exciting facts about the ocean biome, a game to test your child's skill identifying animals of the ocean biome, a game about the threatened & endangered animals of the biome & a fun game using the map & magnetic animals to learn where they live & how they survive there. Let's go on a sensory adventure of the beauty and wonders of the rainforest! Discover eight amazing large rainforest animals including the Jaguar, Okapi, Tapir, Sloth, Mandrill, Chameleon, and Snake. One more large surprise rainforest animal is also included. Watch out for the small poison frog and tarantula hiding on the forest floor! Enjoy building your own rainforest using a camouflage forest floor, trees, a sensory vine, colorful flowers, ropes, and other rainforest greenery. Phase 2 adds to what kids explored in the Explore Rainforest C.E.L.S. Phase 1 & takes it up to a higher level. Your child will be using a world map to learn map reading skills & more about the animals of the rainforest biome. They will also be adding new vocabulary & geography. Includes a set of cards with more info. & exciting facts about the rainforest, a game about the threatened & endangered animals of the rainforest, & a fun game using the map & magnetic animals to learn where they live & how they survive there. Let's go on a sensory adventure into the world of Insects. Look and feel 8 beautiful insects including a Monarch, Dragonfly, Lady Bug, 2 Grasshoppers, Bumble Bee, Praying Mantis and a Fly. You'll have fun examining them with your very own magnifying glass. Have fun capturing them-be sure to look in the "dirt", under the grass or on a flower! World Map to be used when using the ExplorLearning Phase 2 C.E.L.S. Large Bin for use with the Explore C.E.L.S. to keep them contained. “I love how these Explore Activity Cards incorporate different learning styles: verbal/ linguistic, spatial, logical-mathematical, naturalist, interpersonal, intrapersonal, musical, and even smell and taste! It’s so nice to have curriculum ideas right at your fingertips that complement the CELS so well. My kids have really enjoyed all the hands-on activities and projects.” J.M. This fun & engaging curriculum complements your Arctic/Tundra Explore C.E.L.S. Is your student ready to take a step up from free exploration? This curriculum uses the multiple intelligences to help your student gain further knowledge of the Arctic/Tundra. A student can be given a laminated curriculum card to read & work on independently - or parents/teachers can read directions to children orally. You will quickly discover your student's learning-style strengths: verbal/linguistic, spatial, bodily-kinesthetic, logical-mathematical, interpersonal, olfactory, gustatory, or taste. Children will enjoy working on activities in their "strength" areas, while also being inspired to try activities in more challenging areas. This curriculum complements your Forest Explore C.E.L.S. Is your student ready to take a step up from free exploration? This curriculum uses the multiple intelligences to help your student gain further knowledge of the forest. A student can be given a laminated curriculum card to read & work on independently - or parents/teachers cam read directions to children orally. You will quickly discover your student's learning-style strengths: verbal/linguistic, spatial, bodily-kinesthetic, logical-mathematical, interpersonal, interpersonal, olfactory, gustatory, or taste. Children will enjoy working on activities in their "strength" areas will also being inspired to try activities in more challenging areas.